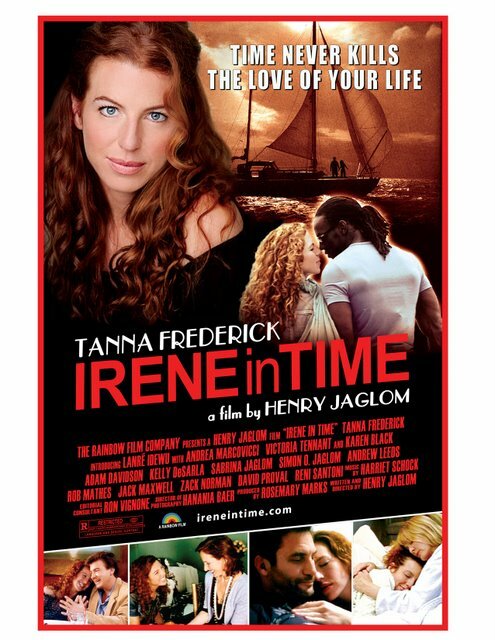 The Actress Who Loves "Putting Things Together"
Recently, Henry Jaglom’s The Rainbow Film Company and actress Tanna Frederick were kind enough to share with me their newest work-- opening in L.A. theatres this weekend—Irene in Time. While you can read my review of the film here and browse our Trailer & Photo Gallery page for the work here, I was especially grateful to chat with the incredibly down-to-Earth and refreshingly sweet, Ms. Tanna Frederick. A brainy and polite conversationalist who thinks and speaks in well-thought out paragraphs—as a fellow native Midwesterner, Tanna Frederick’s genuine friendliness and interest in not only the questions asked but in delving further in the exchange as we shared mutual experiences made the interview a rare treat. Moreover, she’s the type of actress you instantly realize has it much more together than the particular brand of neurotic heroines she seems to master for director Henry Jaglom as witnessed with her award-winning and acclaimed debut turn in Hollywood Dreams. And I think it’s safe to say you’ll agree that ultimately Tanna Frederick is a truly inspiring human being whose passion for her craft is equally matched by her passion to put "things together” as she humbly describes it. For whether she does this by creating a film festival in her hometown or working with Oceana to help protect her beloved surf, overall I kept wishing that more Hollywood Dreams could be like Tanna Frederick’s and less like the ones we see on the covers of gossip magazines in supermarket checkout lines. Thus, this makes her more than simply an actress but a human being who is definitely ready for her close-up. Jen Johans: I really liked Irene in Time; I was wondering since I know you’ve worked with Henry on a couple of projects now—what do you think it is about your personalities that clicks so well? Tanna Frederick: I think an aversion to authority [laughs]… probably a sense of needing to be different and stick out from the crowd—a need to go against the grain. 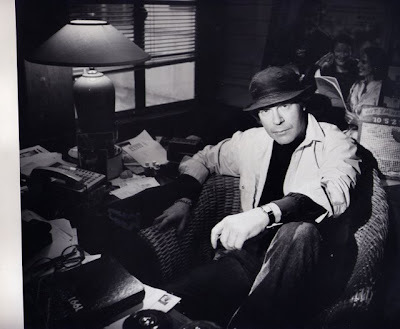 You know Henry and I just both march to the beat of a different drummer than the rest of the film world and I think that we march to each other's beat which is, you know-- if you happen to find that-- that makes for an excellent collaboration and you’re just blessed and lucky. We both have this similar sense of rebelliousness and-- for some reason-- have the exact same taste when it comes to everything as far as our artistic aesthetic is concerned. We both just love the same performances and hate the same films and so on and so forth. And when we start working together on a film, you know he's like everything I could ask for in a director and I hopefully provide the same for him as an actress. We just have fun; we have a blast -- it's like two little kids playing and it's lovely. Jen Johans: And that’s one of the things I wanted to know is about the creative process because the environments in his movies always feel like they're emotionally heightened but at the same time they’re also loose and natural. Do you do a lot of preparation and rehearsal or improvise or do you kind of have to stay with what's on the page? How does that work? Tanna Frederick: I think it's different for every actor’s experience on a Jaglom film but as far as my work has been concerned, it's a little bit of everything. There's always preparation that goes into it. For a film that I did-- Hollywood Dreams-- I just spent a long time watching ‘40s films and reading biographies of ‘40s film stars. And then for Irene in Time, I read a lot of those women’s self-help books and dating self-help books which were just god-awful and so dumb-- you know He's Just Not That Into You, and The Rules-- and then also just really talked to a lot of women about their relationships with their fathers. So there is an element of preparation. But for me, developing the story-- and having done three films with Henry now being there from the start of the idea of the film to the end with it being released-- I like to listen to Henry and his ideas and his concepts and be able to field all that as different actors are put into the film. I’m there for the casting and I have a large hand in what goes on. I know what he’s looking for--I know what he wants from start to finish with the film and I know what the script is even if the script doesn't end up playing out or being used verbatim in the final film. I know the essential material and what to draw out of other actors in the film so usually Henry does one or two takes-- rarely three. 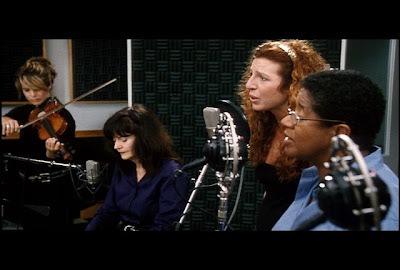 But having that curve or the arc of the story--the information being told in the very first take-- and then just kind of letting the actors just kind of go off in their own place [enables] the improvisation [to happen] in that sense. That’s really what's fun about Henry's films is he’s such a jack of all trades and he's not pretentious when it comes to filmmaking. I mean he knows his films are not for everybody, he knows that he loves making films; he knows what he wants from a film for himself to be happy. I know that can be taken as somebody who is pretentious but it's not; you know it's just him wanting to make art for himself which is really lovely. But underneath all of that he never sticks to one way of how he’s going to get there so he is willing to try some many different avenues to getting the performances out of the actors that he wants to carve the story out of so it's really fun to be an actor in one of his films to try all of those methods to reach a final destination point. Jen Johans: It sounds like it’s very freeing. You mentioned of course, having to read those horrible books [Tanna laughs] and I have no idea how you did that so you're my hero of the day-- they're kind of the books you see at the bookstore and you just walk in the other direction. Tanna Frederick: I know, I know and I was just trying to pick out the worst titles I could find. Jen Johans: Oh, that’s great! Jen Johans: The reject pile! Tanna Frederick: Yeah, and just got the worst titles, the worst and I don't personally-- I’ve just never had a hang up getting along with guys, you know? For me it’s like I’m kind of a guy in the sense of dating ‘cause it's like either it works out or it doesn't and let's just not play games and let's just decide to not go further or whatever. But once you read these books, all of the sudden it's like you develop every single neurosis in the books and you no longer can function. I couldn’t--I couldn't function after I read those; I started second-guessing everything that I did and became this insecure puddle of mess! They’re so bad and I never realized-- it’s like who writes these books? Who gives these books to women? And it must be some hostile, evil person… it’s not good. Jen Johans: Yeah [laughs]! And I was wondering in addition to the books of course, you mentioned watching a lot of old movies for Hollywood Dreams. Were there any movies you watched for this film to prepare? Jen Johans: Oh, Somewhere in Time-- I wondered about that one because some of the film—I mean I can’t give away any spoilers—but in some parts of it you’re kind of thinking is this like magic realism or…? Tanna Frederick: Yeah, yeah and that was sort of the tutelage of Henry because he wanted to incorporate that feel into the film and you know, make it not just about fathers and daughters but interweave a sort of timeless love story throughout the movie. Jen Johans: I know that you guys worked on a sequel to Hollywood Dreams. What are some other movies you have in the works? Tanna Frederick: Well, the sequel to Hollywood Dreams was really, really fun. I got to act with one of my favorite actors in the world—Noah Wylie-- and he was just incredible; I mean it was like this great Kate Hepburn and Spencer Tracy dynamic between the two of us like a new, fun 1940’s Thin Man dynamic. Then this summer I shot a film with director Ron Vignone. He’s an up and coming director I met at the Ashland Film Festival and had a film—Say I Do—which garnered a lot of awards and support from the festival circuit and we filmed this great dark family comedy called Katie Q which is a wonderful little twisted indie flick. I’m really looking forward to that coming out and then I also have a play—I’m going to be doing John Ford Noonan’s A Coupla White Chicks Sitting Around Talking. It’s a great play and I’m going to be doing a five month run out here. Tanna Frederick: I work really well when I have like five things going at once. Henry and I are also working on the idea for the final film of the “Margie” [Hollywood Dreams] trilogy… so I’m going to try to map that out. I find working on many projects and going crazy therapeutic. Tanna Frederick: I really got an amazing experience at the University of Iowa. I think being at the University of Iowa really informed where I am today. It gave me the wherewithal to write, produce, direct and get stuff done. It's a really competitive program but there's so many amazing teachers available at your disposal so my honors thesis project was doing my one woman show. I didn't direct it. I don't like directing; I'm great at being directed and I've tried to direct but it's an unholy terror. But writing I love and I love putting things together. So I think I was able to reference Hollywood and think of it in terms of it being like a big college campus and try to have a great attitude about it and say—you know—this is a great place, it’s going to require some multitasking on my part and me being a hyphenate and producing, and writing and wearing all the hats but that’s okay because I just came from an environment like that and this is a competitive place just like my college was. There’s some immensely talented people here that will hopefully give me the opportunity to learn from them but I'm just going to have to be very self-motivated and build my own projects to get noticed out here and to work in this environment so I think that [The University of Iowa] gave me the confidence and the experience. It’s that kind of “go out and get it” thing of doing what you have to do and I think we’re like that anyway being from the Midwest, right? Jen Johans: Yeah, I think so. Tanna Frederick: You have to wake up every morning and go to work—there’s just no questions asked. Jen Johans: No and I think that’s a really healthy way to look at Hollywood that is proof that hard work pays off and I also liked learning about the projects you’re involved in like creating the film festival there in Iowa. How did that come about? This is our third year but last year was so inspiring. I think that so often you feel when you’re from the Midwest that you’re between both coasts and you don't count or your artistic vote or provisions don't count and you feel helpless like there is no way they can be seen or recognized and you have to be in the big city for those things to happen but that’s not true anymore. The digital age has made I think brilliant filmmaking accessible to everybody and I really felt that last year we saw some wonderful emerging Midwest voices—doctors and lawyers and people making their own films who wouldn't consider themselves filmmakers but now do and are even going onto submitting their work to other festivals so it's a really great, wonderful festival and I'm really happy about it. Tanna Frederick: And it’s really amazing too you know being from the Midwest—people are so hungry and appreciative of good art and to be able to share that with my community in Los Angeles-- to bring out my friends and see their work appreciated and people really participating in what they’ve given their blood, sweat and tears to is just so lovely. My friends who struggle, struggle, struggle out here—their film gets accepted in Mason City, Iowa and they go there and they come back here feeling like a million dollars because they’re not appreciated out here and it’s so beneficial on so many levels. Tanna Frederick: It’s July 17, 18, and 19—three days. We have a great lineup this year—we have Randal Kleiser who directed Grease, The Flight of the Navigator, and White Fang getting the Orson Welles Award. We’re the only festival to exclusively have rights to the Orson Welles Award because of Henry’s relationship with Orson and then we have Eric Roberts coming out to receive a Lifetime Achievement Award. Jen Johans: I was also really interested in the other projects you’re involved in with the ocean and Project Save Our Surf. I was wondering how you became involved in that and how you became interested in surfing? Tanna Frederick: Well we don’t have any ocean in Iowa and it was so magical; I mean, you probably had an amazing experience the first time you saw an ocean too. Tanna Frederick: It’s like, whoa—this isn’t the Great Lakes, honey! I just felt so privileged to be out here and then I started surfing. I’m a black belt in Tae Kwan Do and I wanted to find something that was an equivalent that I was as passionate about as Tae Kwan Do so I took a surf lesson just randomly and just loved it from the get-go. It was just my thing so I became an obsessive surfer, surfing any day that I could. It’s just the water quality here in Santa Monica is pretty terrible and I saw a lot of my friends, a lot of the surfers down here get sick. You can’t surf when there’s been rain because there’s sewage in the water, there’s trash floating everywhere so I wanted to figure out a way to bring awareness locally in my neighborhood which is Santa Monica but I also wanted it to get some national press and make a difference on a global level. Tanna Frederick: Yeah, that was really the hub of my childhood. I spent so much time taking the two and a half hour drive up to The Guthrie Theater—my uncle’s boyfriend was on the Board of Directors so I would go up there in middle school and high school and watch the shows. It was so inspiring. I mean The Guthrie Theatre was so edgy and feisty and so like indie and just naughty and it was so, so great. Jen Johans: I know, I miss it. I’d love to go back and see what they’re playing now but it was so cool to see people like Don Cheadle and Gary Sinise and Patrick Stewart that would come to the Guthrie. And I remember as a child thinking, “They’re coming to Minneapolis? !” Just like with your film festival—we’re hungry for art. Tanna Frederick: That’s like my all-time dream is to go back and do a show at the Guthrie, you know? Jen Johans: Oh, I think that’d be great. Jen Johans: I think you’re already there.